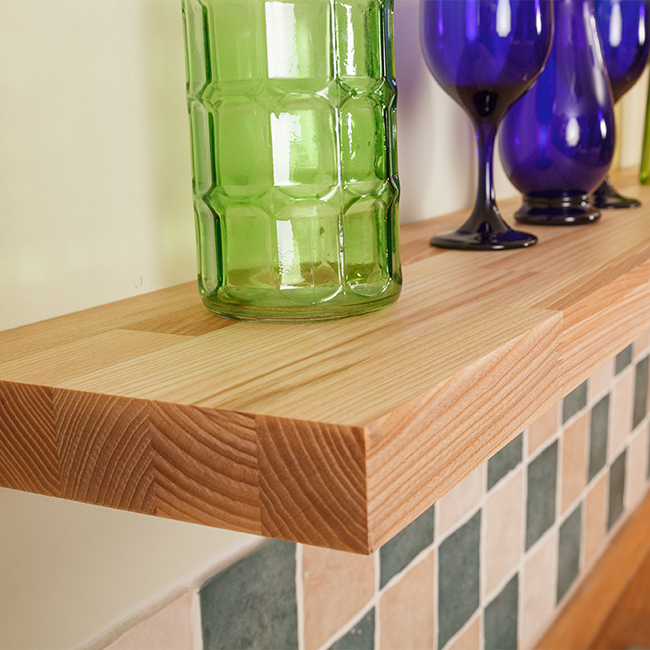 Accessorise real wood kitchens with a charming ash shelf from Solid Wood Kitchen Cabinets®. This appealing real ash floating shelf has been pre-drilled to save our customers time and hassle, and comes supplied with the specialist fixings required to create an enviable floating effect. Each exquisite ash shelf has been conscientiously crafted by a team of specialists, who have spent years designing, creating and crafting stunning real wood products. Using only the latest manufacturing methods, these shelves are made with the utmost precision. Once cut to size, they are sanded to a 150 grit smoothness and finishes with several coatings of oil, which protects and nourishes the wood grain. Our floating shelves come with all the fittings required to allow for straightforward installation. This floating solid ash shelf measures 600mm X 200mm X 40mm and comes with an attractive square edge profile to complement the design of our coordinating ash worktops. We make these shelves using the same methods used to assemble our wood worktops, by finger-jointing a collection of 40mm-wide wooden staves and bonding them with glue under high pressure. These 600mm ash shelves come with two floating shelf brackets, which we recommend fixing to a brick, concrete or stone wall for the best support. If you have a stud partition wall, we strongly advise fixing the brackets directly into the studs to ensure the shelves are adequately supported. Real wood shelving is made entirely from organic material, and therefore can showcase an array of natural developments such as small knots and splits. These features do not compromise the strength of the shelves, but enhance the innate natural beauty of the wood. from Solid Wood Kitchen Cabinets.